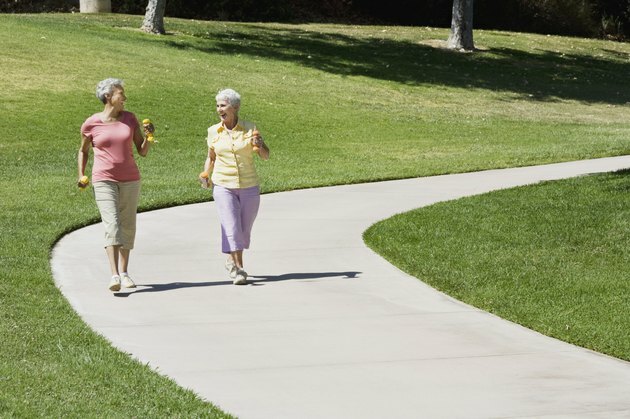 Walking--even at a slow rate of speed--can be a great workout for your muscles, joints and cardiovascular system. People who walk regularly lower their risk for cardiovascular diseases like heart and lung disease and also burn calories which can help keep weight in check. If you are looking to increase your workout while you walk, there are a number of things you can do, such as walk faster or for longer periods of time. Walking with weights may be an option and does provide some benefits but can also cause a variety of health-related problems. You should consult with your doctor before adding weights to your walking routine. Walking with hand weights can help you burn more calories when you walk, but you must use them correctly. If you swing your arms to shoulder height for 20 to 30 minutes, you may burn up to 10 to 20 percent more calories than you would without the weights. Ankle weights have the same effect, increasing the workout on your leg muscles and therefore burning more calories. But walking with weights only equates to walking about five extra minutes, and the risk of injury may outweigh the minimal benefit. Walking with ankle weights can be hazardous to your knees. Talk with your doctor before you start walking with weights. The added weight of walking with ankle weights, which your body is not accustomed to, can cause injuries to knees, hips, elbows, shoulders and ankles. Also, walking with hand weights can throw off your natural walking motion and cause you to stride differently. This causes strain to your joints and ligaments, which can lead to soreness and swelling and put you at increased risk for injury. Discover Walking and The Walking Site both point out that walking with hand weights or dumbbells can cause high blood pressure caused by gripping the weights tightly. Squeezing the weights for an extended period of time can raise the blood pressure. If you walk carrying weights several days per week for an extended period of time, your blood pressure could be adversely affected. High blood pressure can lead to other serious health problems such as heart disease and an increased risk for stroke. You should be an experienced walker before using weights, meaning that your routine, which should include walking fast and uphill, is no longer challenging for you. Start by using 1-lb. weights and bend your elbows to 90 degrees when swinging your arms. Do not increase the weight by more than 1 lb. at a time. You can also try weight vests. They are easier on your back and joints, but you may find them uncomfortable, especially in the heat.